A new year and a new batch of scary movies to review. January has become the dumping ground for horror movies that are not quite good enough to hold their own during the more appropriate months of September/October. First up is the latest Paranormal Activity film. 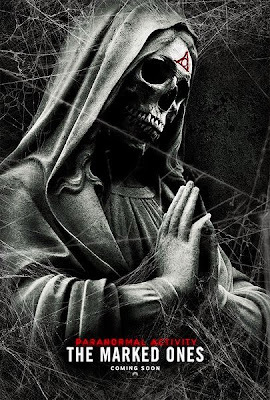 The Marked Ones is a supposedly a spin-off from the series but really it’s just more of the same with a Latino cast. It is a vast improvement over part 4 but the same formula that runs through all these films remains painfully intact. I was hoping the new setting would lend itself to better storytelling but until the series ditches the “found footage” angle, the plot will remain tied to the unbelievable conceit that someone – even in peril – will continue to point the camera at a horrific event. The action has moved from the lily-white, rich homes and into the barrios of Southern California. The cast is superb and makes this the most entertaining, fun and watchable entry of the series. And the humble setting feels much more genuine and realistic. When the supernatural stuff happens, the effects are so seamless that they defy logic and add an unsettling eeriness. There’s definitely more action here – we’re not watching pool cleaners or bored millennials on their laptops – which helps make this a more entertaining entry. Yet even with so many positive things going for it, the last act devolves into the greatest hits of Paranormal Activity (out of focus running, gasps and screams in sudden darkness, figures pop up out nowhere and lurch, etc. etc. ) Schtick-and-shocks instead of real scares or storytelling. And then the dreaded ending: fade to black. UGH. Seriously? Again? Apparently found footage means you never need to finish the story.